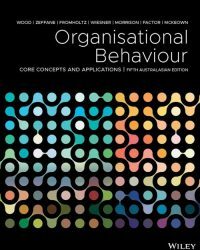 This fifth Australian edition of Wood’s Organisational Behaviour: Core Concepts and Applications, 5th Australian Edition presents Organisational Behaviour in an interactive digital format and is an ideal text for students interested in management or human resources. The information is offered in a clear and visual manner without overwhelming you, and focuses on real and relevant issues, such as: the changing nature of work, diversity in the workplace and globalisation. Available as a full colour printed textbook with an interactive eBook code, this title enables every student to master concepts and succeed in assessment by taking the roadblocks out of self-study, with features that are designed to get the most out of what you’re learning. This edition includes enhanced and updated coverage that’s complemented by features like: videos to help you connect concepts with real-world cases, animations and interactivities embedded throughout the text to bring the theoretical to life, Concept Check questions that are placed at the end of every chapter to test your comprehension and allow you to get instant feedback on where you strengths and weaknesses lie, and the opportunity to work between the online (interactive e-text) and offline (print) to cater to how you study best, with the ability to search, highlight and annotate within the digital text. Chapter 1 What is organisational behaviour?